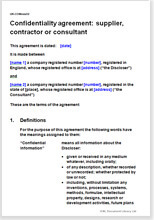 Use this confidentiality agreement for situations where a contractor, consultant or supplier will learn sensitive information during the course of their work or service for you. The sensitive information may be directly related to the service the other party is carrying out (for example, a management consultant may need to know directors' salaries, or a parts supplier might need to know exactly what you are manufacturing with the machine) or the other party may find out in the course of providing the service (for example, IT contractors may find out the identities of some of your clients as they fix a computer or a bathroom fitter might find out your hygiene habits). You can use this confidentiality agreement to prevent the contractor or supplier from acting on the information and thus you can help protect your personal or business information or ideas. Signing a confidentiality agreement also reminds the other party that the information is sensitive, preventing them from claiming ignorance of its value to you. Of course total secrecy is best. But there are many occasions in life when secrets need to be disclosed, or might be found out. This document is drawn broadly to cover all information passing to the other party, but in a way that enables you to insert your own precise secrets if you want to specify them. The document gives you choices as to how you want the recipient of your information to deal with it. You may limit disclosure to the person who signs this agreement or you may allow him to pass the information to other professional advisers or employees or consultants. You decide. A supplier will need to become involved in your business or personal affairs (perhaps in order to deliver the service or goods).